Depart London Heathrow for Ivalo (via Helsinki). 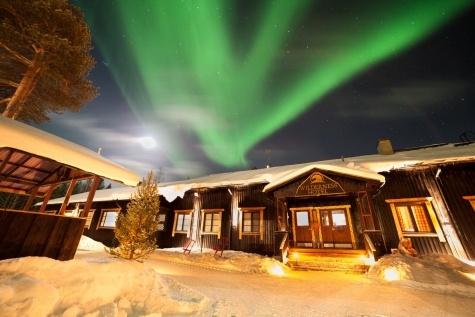 On arrival you will meet your local guide for the 1 hour private coach transfer to the magical Nellim by Lake Inari. At the hotel make straight for your accommodation, where your thermal clothing will be ready. Enjoy a welcoming buffet supper before heading straight out into the powdery pristine snow-covered playground surrounding the lodge. This morning starts with a wilderness adventure – a safari by snowmobile. Follow your guide along a forest trail amongst the pine and spruce bordering the shoreline of Lake Inari. 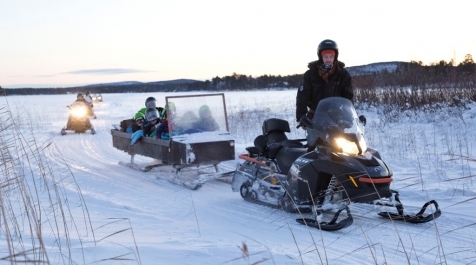 Grown-ups are paired together, taking it in turns to drive, whereas the children enjoy their own ride, wrapped up under warm reindeer skins in a specially built sleigh and driven by your Lapp guide. Return to the lodge for a hearty lunch. 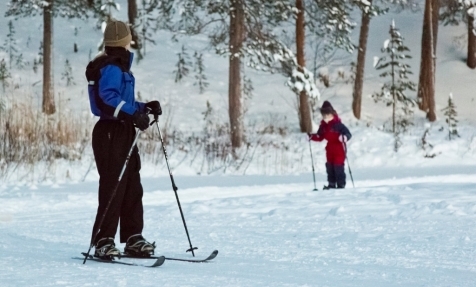 Spend the afternoon on the frozen lake with tobogganing, ice fishing, snow shoeing and cross-country skiing. Later, each family is given a secret undertaking. You will board a snowmobile sleigh, which will transport you and your family deep into the forest to a destination only known to your guide. Once you’ve arrived at this enchanted place, a friendly elf will reveal a sensational secret - Santa is waiting! 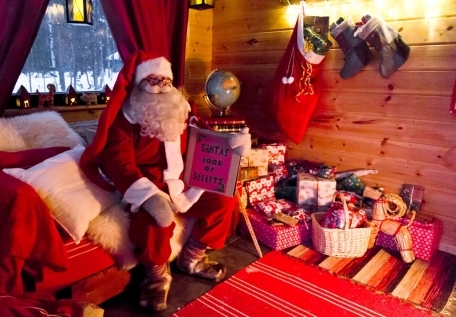 Santa will listen to everyone’s wishes, which both he and the Sami Spirits of Inari will try to make come true. Return to Nellim for an evening of cookie baking and dinner. After breakfast it is time to embark on a husky safari. After greeting the excited howling hounds, adults take charge of a sled and mush in pairs. Children have their own special ride. Lunch is served back in the hotel, before travelling to the local reindeer farm to meet some of Santa’s hard working herd. On your return to Nellim you will decorate a Christmas tree before a traditional Sami Christmas buffet supper. Later you hear the distant sound of Nellim’s school children calling in the wind amongst the trees and discover they have told Santa where you are. Santa has returned to deliver a small present to grown-ups and children alike. After breakfast, time at leisure for last minute tobogganing and snow shoeing at the lake’s shore before transferring to Ivalo for your return flight to London Heathrow. Temperatures can vary at this time between 0°c and -30°c. as such local conditions can mean that the itinerary, location, duration and order of excursions may change. Any decision to do this is to ensure your comfort, enjoyment and safety at the resort.